"How to groom cat hair changes based on the length and type of hair. Long hair requires combing while short hair needs less care. Combing and brushing will remove lose hair and help to avoid the formation of hairballs. Regular grooming will also help to keep the skin and coat healthy. A grooming routine should be introduced when a cat is young so that it becomes a familiar part of the cat care routine. Grooming is usually more easily accomplished on a counter or table. Short hair cats can be brushed and then combed or grromed weekly or bi-weekly. A damp rag or cloth can pick up any lose hair. Long hair cats can avoid matting with daily combing. If mats do form, they need to either be carefully removed by an owner or preferably by a groomer. Failure to remove mats can result in skin problems such as sores. Diet such as the proper amount of protein intake and vitamins contribute to maintaining a healthy coat. Problems such as a cat losing hair can have multiple causes including parasites, illness, allergy and stress. Cats shed hair year round, with an increase in the spring. Shedding is not excessive until you see bare skin spots in areas that usually have hair. If this occurs or if a cat suddenly stops grooming, seek medical attention." Cat hair protects your cat's body from foreign objects such as insects, helps regulate temperature and enhances the sense of touch. Guard Hairs: Long course hairs that insulate your cat's body that also help with the sense of touch. Awn Hairs: thin hairs that are within the coat. Insulates and protects the body. Secondary Hairs: part of your cat's undercoat. The hairs are the thinnest on the cat and help control temperature. A cat has a rough tongue which helps remove lose hair and dead skin. Not all cats are good about grooming themselves, requiring an owner to do the job for them. Cats have the toughest time reaching the middle of the back and rump. Obese cats also have trouble with grooming. Healthy cat hair will appear glossy and unbroken. Darker coasts have a more natural sheen. After grooming or cutting cat hair, it takes approximately 3 to 4 months to grow back, but can take longer in long hair cats. It is a good idea to begin brushing your cat's hair from the time it is a kitten so that your cat gets used to it. This will help remove hair that has been shed that can cause the coat to mat. Brushing contributes to a clean look by stimulating the release of protective oils. It also keeps your cat from ingesting any hairs which leads to hairballs. Try and get your cat used to a familiar grooming routine. Introduce grooming or brushing when a cat is a young kitten. Hold the kitten when she is sleepy, and begin to brush as if you are petting the cat. Provide a treat if needed to make the experience pleasurable. For adult cats, start by allowing the cat to come to the brush, or become familiar with the brush. Start by brushing the cat hair in an acceptable area such as the face. Do this once a week. Gradually move to other areas of the body, then increase the number of days if necessary. Let the cat believe that it is an experience similar to petting. Tip: Never use the brush as a toy, since the cat may learn this as a behavior and continue to "play" with the brush every time you attempt grooming. If a cat absolutely refused hair brushing and may even scratch or bite in response, then there is no choice but to use a groomer or consult your veterinarian for possible causes. Long Hair requires brushing with a Cat Pin Brush to avoid having the hair mat. Groom as frequently as every day to collect hair that is shedding, but not falling off the body. The teeth of the comb should reach all the way to the skin. 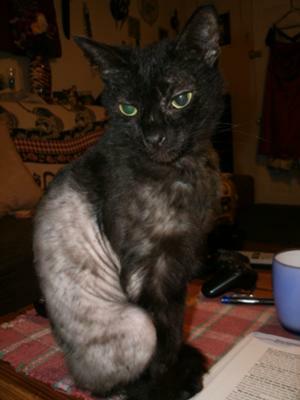 You might also want to consider a cat lion cut which keeps the hair short with exception of the face and the mane. As a first step, pat and inspect the hair with your hand to locate any cat hair matts. If you find any hair mats the best way to remove them is to pull the hair apart with your hands. After the mat has been removed, comb through the previously matted area with a metal comb. Follow this with a bristle brush to remove any loose hair. Do not cut the mat out since it is very easy to injure the cat's skin. As an alternative tool to a metal cat comb, many owners recommend the purchase of a Furminator, which is a combination comb and blade. This is a particularly good choice where daily grooming of a long hair cat is not an option. Close Coated: You can care for short or close-coated cat hair by lightly moving a soft chamois over the coat. Short Hair: requires little combing or bathing. Use a bristle brush or a 4 inch fine/medium (also called a greyhound style brush). Brush against the direction of the coat at first and then finish by reversing and brush in the direction of the coat. Harder brushes help to avoid knots. Softer brushes are good for sleek coats. Mutant - short curly hair or coats that are woolly (eg; require wire pin brushes that are with or without rubber tips. Wire-pin brushes are the preferred choice for cats with medium to long hair and those with curly or woolly coats, such as the Rex breed. Combs also work well for curly coats. A Flea Comb can work well for delicate areas such as the face. If you cat does not like it when you brush its hair, there are some alternatives. Each can be purchased by following the links below for approximately $5. Grooming Glove This glove is worn on your hand. It has prongs that work as a brush as you stroke your cat. Gentle way to remove lose hair, particularly if your cat sheds. Rubber Curry Brush. The palm brush is hidden in your palm. The rubber bristles are soft and lets you brush your cat without your cat really knowing. Helps add a sheen to the coat. Wall Grooming Comb You can buy a brush that attaches to the wall. Your cat will rub up against the wall and and brush itself. It has a small compartment for catnip which encourages cats to rub against the comb's teeth. Great to catch hair before it sheds. Another trick is to store brushes in a bag with a few pieces of catnip. Many owners only give a cat a bath when he or she really needs it. Be careful when bathing a cat since many will try and attempt to escape the bath, including the use of the claws. The job often requires two people, with one holding the cat and the other applying the shampoo and water. One approach is to place the cat in a sink filled with a little water. Rinse the cat with a cup of water taken from the sink. If your cat doesn't sit still for the bath, try the groomer. You could also try a natural supplement such as Pet Calm to see if it helps your cat stay still or at a minimum easier to handle. All cats shed hair throughout the year. The amount of shedding depends on where the cat lives, nutrition and health. Sunlight and artificial indoor light affects when cats shed with outdoor cats shedding more in the spring and fall and indoor cats shed throughout the year. Cat hair grows quickly and then slows until it stops. New hair growth then starts pushing out the older hair, causing shedding. Check your cat's health with a veterinarian if you notice excess shedding. The hair itself is made of protein. If your cat's diet doesn't contain enough protein from animal (chicken fat) and plant sources (vegetable oils such as corn and soy), then the hair could be too dry, fall out or feel brittle to the touch. Most commercial cat foods contain adequate amounts of two fatty omega-6 fatty acids are important for coat health in cats. Linoleic acid helps the coat from becoming dull and dry. It also helps avoid hair loss and greasy skin. Cats also need arachidonic acid for normal skin and coat health. Kittens require that 30% of the diet be protein and adult cats should have 25-30%. If your cat is getting a balanced diet and you still see problems with his or her coat, then consider a fish oil based fatty acid supplement such as Nordic Naturals Omega-3 Pet - Gel Caps. * Equisetum arvense (Horsetail): Has high silica content essential in the maintenance of healthy and strong skin and fur. * Taraxacum officinalis (Dandelion): Source of vitamins and minerals, including Vitamin A, D, C, various B Vitamins, iron, lecithin, silicon, potassium, magnesium, zinc and manganese. * Arthrospira platenis (Spirulina): Has nutritive properties, protein, vitamins (including B12 and folic acid) and carotenoids. * Fucus vesiculosis: contains minerals, iodine, potassium, magnesium, calcium, and iron. Regular use will also promote skin and coat condition. * Kalium sulphate (Kali. Sulph. ): helps cell membranes, and maintain balance in the skin and underlying tissue. A supplement made for this purpose and that is worth exploring is Skin and Coat Tonic. It has a reputation for helping cats maintain a healthy skin and a glossy coat using a combination of the ingredients listed above. Cat hair loss has multiple causes including parasites, illness, allergy and in 10% of cases due to stress. To diagnose feline hair loss your veterinarian will first do an examination to look for a parasitic cause such as fleas or mites (mange). Even if you can't find any fleas, don't rule them out, even for indoor cats as humans could have carried them into the home. They are also great at hiding with only a few fleas needed for a problem to occur. Once these are ruled out they will look for allergies such as from foods or something in your cat's environment. Round hairless areas on body. Classic round skin irritation may be on people in the household. Feline hair loss can also be attributed to diseases such as Diabetes Mellitus and thyroid disease. Other symptoms that are clues to the reasons for hair loss in cats include excessive urination, excessive appetite and other changes in behavior. In general, grooming and shedding should take care of your cat's hair. If your cat requires feline hair cutting then be very careful such a cat's skin is very thin and can easily be cut. Preference should be for a professional groomer. If you cat suffers from matted hair consider rubbing some corn starch into the hair and leave on for 15 minutes and then try brushing. This will absorb moisture and help with the combing process. One way to get started is with the cat hair clippers and grooming kit offered by Oster. Finding a feline hair vacuum can be challenging since not every vacuum is created equal when it comes to picking up feline hair. Fortunately, Consumer Reports rates vacuum's on this statistic. Their top picks are all listed on our feline hair vacuum guide. The top picks in Consumer Reports for pet hair is the Miele Twist, and for a best buy the Kenmore Progressive 31069.